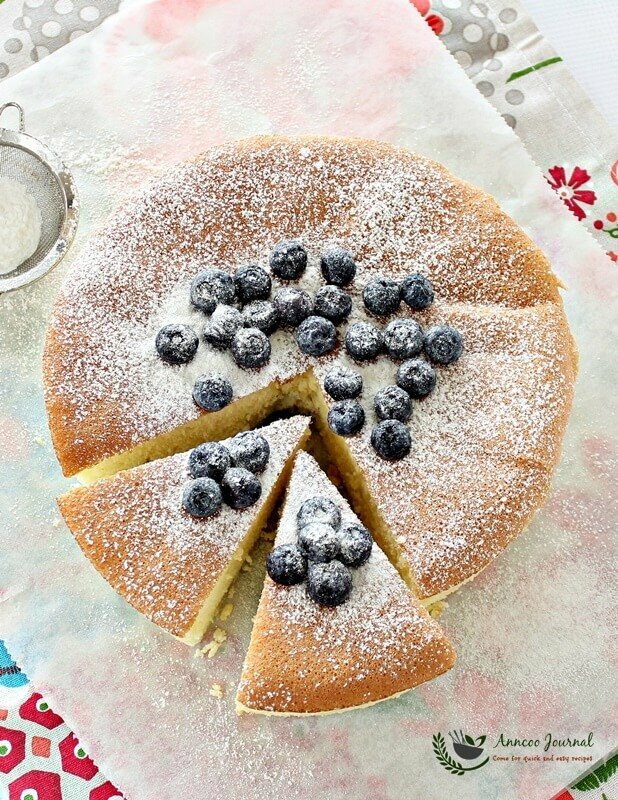 Today I’m sharing with you a Wheat-Free Sponge Cake that I picked up from Australian Weekly Cookbook. I’ve never tried to use only corn flour to bake a cake before and I’m also really curious about the recipe with only eggs, sugar and corn flour and no baking powder or butter. As the recipe looked really easy to make, I just went ahead to bake this cake two days ago. After I put the cake pan in the oven and set the timer for 20 minutes, I came back to check the cake in the oven after 10 minutes. I just couldn’t believe my eyes that the corn flour sponge had risen high and was a nice golden brown. So I waited for the timer to buzz, checked the cake and made sure it was cooked, immediately removed the cake from the oven and unmold the sponge to cool. WOW! The cake is so feathery light and soft! It wasn’t very sweet as I’ve reduced the sugar a little too much, so it tasted a little bland (without the dusted icing sugar) but you can add more sugar if you like. Anyway, we finished off half the cake immediately with fresh blueberries accompanied by a cup of English tea. Preheat oven to 180C. Grease with butter or cooking spray, 20cm/8 inch round cake pan; line base with baking paper. Beat eggs with 2 tsp vanilla extract at medium high speed for about 10 minutes or until thick and creamy. Gradually add sugar, beating until dissolved between additons at medium speed. Sieve in the corn flour little by little for the third time and fold well in with a rubber spatula. Pour mixture into pan and spread evenly; bake for about 20 minutes or skewer inserted into the cake comes out clean. Dust with a little sifted icing sugar and top with some fresh blueberries or any berries you like. Can also spread some jam to go with it. Great recipe! I used it to make a jellyroll and it came out perfect. I used coconut sugar instead of white which gave it a wonderful caramel flavor and I added vanilla. I subbed the cornstarch for tapioca starch and used a whisk to fold it in instead of the usual rubber spatula, which helped incorporate the starch without deflating the batter. If your readers find it dry, I suggest lightly brushing it with a soaking syrup or diluted jam, or placing macerated berries on top. My jelly roll cake was better after a few days of the syrup and whipped cream really moistening the cake. I wrapped it in plastic or you can put it in a covered container. Hi Ann, made the cake yesterday for father’s day as my husband is gluten free, it has the characteristics of an angel food cake, so I served it with some strawberries and whipped cream and it was delicious, light and fluffy. I noticed that it took a long time for the eggs to get to soft peak stage, is it because I used a hand mixer? Eggs not at room temp? The top of my cake deflated slightly so after it cooled, it looked cracked like the top part of a brownie, how do I get it to look smooth like yours? Thanks! Hi Michelle, It’s always good to use room temperature eggs unless otherwise stated. Cold eggs are moist and heavier. Most important is to use fresh egg. For the uneven topping of the cake was probably due to the inconsistent heat in the oven. You can usually see this happen in muffins or chiffon cake after baking. If the top of the cake is getting to brown, just place a piece of aluminium foil over it and continue baking. I just tried this cake and it turned out super dry and there’s a hard layer at the bottom that i had to slice it off. What could have caused it? Hi Low, you need to fold the batter gently well, otherwise the the flour will sink to the bottom if it not well mixed. Hi Anne, it is nice to see this old cake-making method (called the Genoise method by the French) becoming more popular. I like to use this method for all kinds of flourless cakes. Here are some tips that may help your readers. * First, the eggs must be very fresh because they are providing all of the structure and the leavening. Of course you MUST beat them for the full 10 minutes until soft peaks form. You can add the sugar to the eggs all at once at the beginning if you wish. * After you have beaten the eggs to the Soft Peaks stage, use a flexible spatula to scrape up any remaining liquid egg from the bottom of the bowl and beat it for a few more moments. * It is important to fold in your ingredients and place the cake in the oven immediately after beating the eggs. If you let them sit they will lose their strength and ability to hold trapped air, and the cake will fall. * Ground hazelnut flour/meal and cocoa powder. * Ground almond flour/meal and some almond extract. * Ground walnut flour/meal and lemon and orange zest, sweetened with honey instead of sugar. Coarser flours and nut meals give the cake a coarser texture but it is still lovely and moist and delicious. This is the best cake ever, my son is coeliac and this is his favourite treat. We cover the cake with rasberry sauce made with frozen rasberries and a bit of sugar. Absolutely delicious and so light it melts in your mouth!! Ann, can I use this cake to make birthday cake? To cream the cake with whipping cream or frosting? I think not many people will enjoy this cake very much as a birthday cake because it has a powdery after taste. Suitable to go with jam or berries. Hi Elyn, I don't understand why your cake wasn't cooked even though you made it into cupcake size. It might be probably due to the eggs were not beaten thick enough. By the way, what type of oven are you using? Just tried this amazing recipe and it turned out great! Thank you so much you are awesome Ann! Hi, I think you can add 1-2 tsp of matcha powder into it but I'm not sure about the texture. Please feedback to me after trying out. is it possible for you to post the picture of the corn flour you used? Hi Miss Homecook, Sorry thatI don't have the packet of the corn flour on hand now. You can use those cornflour for thickening soup in this recipe..
must we use a electric hand mixer or can we just use a regular whisk? Yes, of course you can but you'll need a good strength to whip up the batter. Just tried this recipe. When out from the oven it looked to nice as it rise so well. After a few minutes when I turned it to cool down, it was so wet at the side facing down. I think your cake is not fully baked yet. As oven temp varies, you may need to bake the cake for a few minutest longer. I will definately be trying this out soon. My husband is gluten free, so I am used to gf cooking but our 9 month old daughter is allergic to every grain we have tried so unfortunately we are limited to corn flour with her, but I have already been thinking of birthday cake options for her. I am excited to try this out to see if it will work for her 1st birthday! Hi Ann, thank you for sharing recipe. Its so easy to do n follow . Butmine has this floury after taste . Wonder if I did it correctly …? Hi Connie, Thanks for trying this recipe. Yes, the floury after taste is came from the cornflour. That was why I mentioned to go with some berries or jam. Hi Ann..i just tried your recipe and it come out great. However it smell like raw egg. But its cooked. Maybe i need to add more vanilla? Hi, The smell is from the corn flour. Can add more vanilla or orange zest. hi there, just wanna clarify something…'thick n creamy' is refer to soft peak stage? or stiff peak stage? before adding corn flour and the sugar in?? thanks..
Hi Dream, With the whole egg used, the batter usually comes in double volume, thick and soft peak stage. sorry, i got another question again.. how much is the protein content in the cornflour that you used? it is because i saw there are 2 types of different protein content for the cornflour….one is 8.6g and the another one is 0.6g…so is it okay for me to choose that contains 0.6g protein content cornflour? thanks. Hi Dream, I didn't look at the percentage of the content in the cornflour. Just bought the ordinary cornflour from the baking ingredients shop. The cornflour that I'm using is also for thickening in the soup. Hi Ann, thank you for sharing this recipe with us. Can you please specify whether you use corn starch or corn flour? I am from the US and a bit confused. Looking forward to your reply, can't wait to try this! Hi Mira, Corn starch and corn flour are the same. You can use any of these. dear Ann, love all your recipes. but, its so confusing about the corn flour and corn starch issues. All I know that they are two different things, like some readers already mentioned too in the past. Most Asian countries are only familiar with corn starch. Here in Indonesia, we call it MAIZENA. But since i am a US citizen, I am also familiar with corn flour. I use it when I make corn bread, corn torilla, etc. If this cornstarch/corn flour issue confuses anyone else, I’ve lived in the US my whole life so I can say that corn flour = cornstarch (white super fine powder). Corn MEAL (yellow or white, coarse and gritty) is used in cornbread but should not be confused with masa mix/flour (speckled white medium grind corn with mineral lime) used for corn tortillas and tamales. I hope this helps anyone who may be confused. I will try this recipe! I love this recipe. I've baked it three times, still not with a consistent result but it's so versatile. I didn't have vanilla extract the first time so I replaced part of the solids with some powdered chocolate. It turned out soooo perfect. Second time around, I didn't whip the eggs enough cause I don't have a mixer but did it by hand and it ended up soggy but I cut off those parts and it still tasted great. It's in the oven now for the third time (I've baked once every month), in cupcake liners, they've risen nicely but they seem so soft and I'm worried they deflate too quickly. Either way, I'm sure I'll be making this over and over with many other variations. I guess it just needs an electric mixer, I don't know. The cakes deflated and the bottom half was like hardened glue. I manage to pry off the top portion and they were so light and spongey and kept their shape. I cut them in half and spread some jam on them so we could have them with tea. Not sure what made the bottom cement like that. The chocolate version was the best so far. And I beat the eggs in the same way. Yes, Hope you can a electric mixer soon. You can buy a hand electric mixer, that is cheaper and handy. You must fold the mixture well with a rubber spatula. Please don't push yourself too hard, just take it easy when comes to mixing the batter. I tried it out..but beat it all by hand and replaced the vanilla with lemon extract. The batter was really really watery!! What should I do? 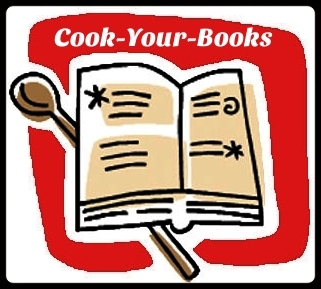 Hi, you must beat the egg till thick before adding the sugar and corn flour into it. Is better to use an electric mixer than by hand. I tried the cake, it was easy to make and tasted ok. Personally, I found it to be too dry for my liking, still prefer the taste of chiffon cake. Just leaving a note for reference in case you decide to make this but don't like dry cakes. Your cake looks so soft and delicious! Only three ingredients!! Fantastic! 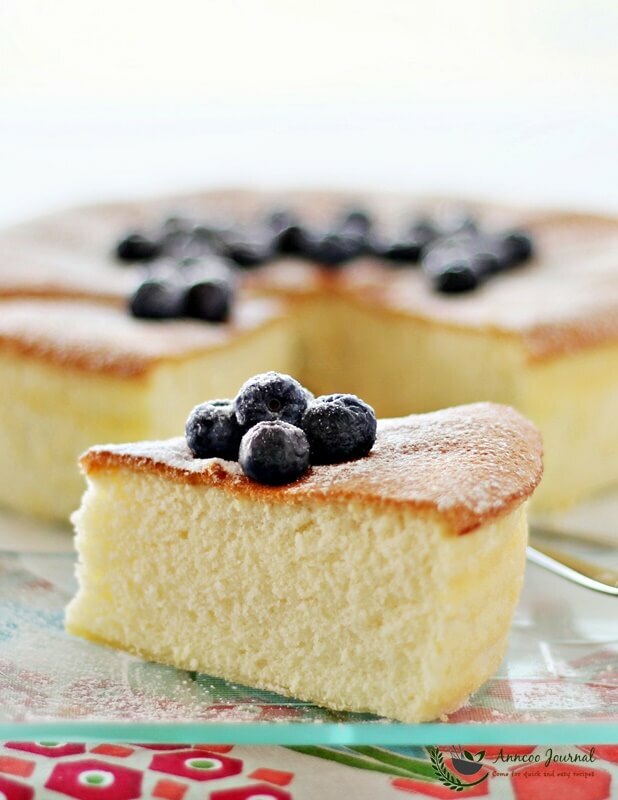 Can I used 17cm chiffon cake tin instead of 20cm round tin to make this sponge cake? Hi Selina, you can use a 7 inch square pan. As long as the batter is about 3/4 full of the pan, then it should be OK.
Ann, I bake e cake at last cuz can't wait till tmr lol. I separated into two aluminium loaf tin & It turn out successfully, but e problem is I need to keep adjusting e temperature cus it brown too fast on top, dont know isit bcos of e temperature. But after all the cake is light & tasty & e sweetness is just right for my family to go with tea. Selina, hehee… thanks for trying! Next time when your cake is browning too quickly in the oven, you can cover the cake loosely with an aluminium foil. Try not to touch the cake with the foil to prevent it sticks. Noted & tks for advise. I'll share this recipe with my relatives, friends & colleagues. note: the beating of eggs must be thick and fluffy. Ann, perhaps it helps to mention in the article that Australian/British cornflour is known as cornstarch in North America? I believe the people who end up with a dense and hard cake are using cornflour in the US, which is a rather different thing (US Cornflour = very finely ground cornmeal). I've been looking for a light and fluffy sponge cake recipe for a while and I think I've just found it! This sponage cake looks amazingly soft and light – exactly the way I like it. Thanks for sharing it and I can't wait to try it out!! Only 3 ingredients! amazing sponge cake! shall try one day. You mean like Swiss roll? I don't so because this cake is super soft and light. I made them yesterday for afternoon tea. Taste so good! Instead of using the baking tin, I used the paper cupcake liners. This is definitely a keeper! Thanks Ann for sharing the recipe. Happy to hear that 🙂 Yay!!! i am also surprised knowing just by using cornflour alone to produce such a beautiful and featherlike cake…hopefully can try this out one day! I'm so jealous! I always have trouble turning out cakes like these because they never rise as high as they should but yours is absolutely perfect! Would it possible to substitute the corn flour with cake flour? With only 3 ingredients and the cake turned out so soft, it is so amazing! 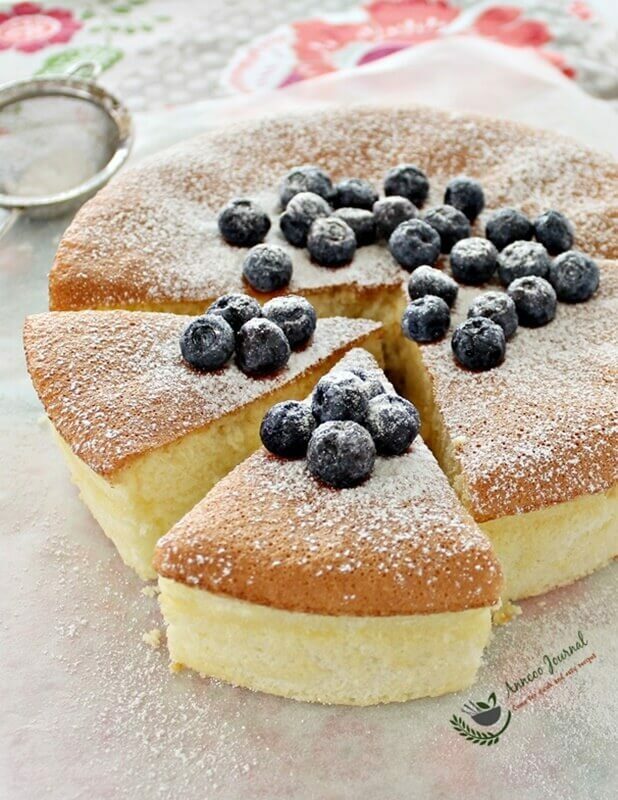 Wow, I sure want to try this cake…looks very light and fluffy…only 3 ingredients! Beautiful! Thank you Juliana. Happy Sunday! is that the weight of the eggs in the shell or without? Hi Zosia, The 65g egg is with shell. Don't have to be too exact, slightly more or less would be ok.
Hi there! I'm a little confused, is corn flour the same thing as cornstarch? Hi Cindy, Corn flour is cornstarch. Hi Cindy, Oh, I didn't know there are the differences between cornflour and cornstarch as I always used cornflour for thickening. The packaging that I bought was cornflour. Thanks for sharing this wheat free sponge cake.. I will bake one for my wheat intolerance hubs ..
Really a nice cake, have to try this next time. wow! I have never tried baking with just corn flour alone too! This I got to try, it looks so fluffy! I trust you wholeheartedly, Am going to bake this real soon. I think I am running low on corn starch now. Could this be the winning recipe that Li Shuan mentioned b4? Anyway, this is definitely a very special recipe. And eating it with fresh fruit is also my favourite choice. Thanks for sharing such a great recipe, Ann! Jessie, I don't quite remember which recipe Li Shuan mentioned. Must check her post about it. Right, I also love to add fresh fruits on cake, makes the cake moist and delicious. Three ingredients? I would have never though corn flour would make something so smooth and bouncy – love it! Wow! I must try out this Saturday!! Ann, you mention to use 3 eggs of 65g each….what happens if my eggs are too big and how to adjust? Eg total weight of 3 eggs at 65g each is 195g but I am using 70g big eggs so I only need 2+ eggs….so what should I do? Hope you understand what I am saying…Thanks! Ai Li, no problem to use 70g egg. Just use a 8 inch round cake pan with 3 inches high. The cake will definitely rise above the rim. Remember to fold the cornflour well in the egg mixture. Thanks, Ann! I think to be safe I will go and buy 65g eggs. I want to follow the recipe to a T. Definitely trying out this Saturday. By the way, can I grease the pan with butter or oil? How do I check that the sugar is totally dissolved in the batter? Thanks for your help! Ai Li, yes you can grease with butter. I also not very sure whether the sugar is totally dissolved or not. Just add little at a time and whisk a little longer after each addition. Thank you Ann! I already got the eggs (not exactly 65g though) and so I will baking them this Saturday. Will let you know how it will turn out under my hands. Thanks again! Hi Ann! I baked this today. Indeed it is very soft. I burnt the top a little thus it is a little crispy….its a little crumbly and chewy. Is it how the texture should be? Nonetheless, it is a nice cake! Hi Ai Li, Thank you for trying this recipe. Yes the cake is a little crumbly and the chewy texture is probably you've over baked the cake a little. Made with 100% cornstarch, no wonder the cake looks super light and airy. Well done, Ann! Hi Ann, your sponge cake look so cottony soft and delightful. Thanks for sharing your recipe.